When people first get into fundraising, they have two questions that always make me smile. I won’t get into the former – there are so many great resources out there who can help you with that – Marc Pitman, Mazarinze Treyz, and Shanon Doolittle to name just a few. But I can definitely help you with the latter. I wanted to be a writer since I was a small child. But if you had told me then, or when I was a brooding teenage poet, or even a budding film script writer in my early 20s, that my career would be spent writing direct mail and other content for nonprofits, I likely wouldn’t have believed you. I may have written a haiku about how ridiculous that sounded. And yet here I am. And I’ll let you in on a secret – when I started writing fundraising copy, I was scared shitless. Fundraisers and do gooders come in all shapes and sizes, but one thing we all share is the need to be strong communicators across many channels. 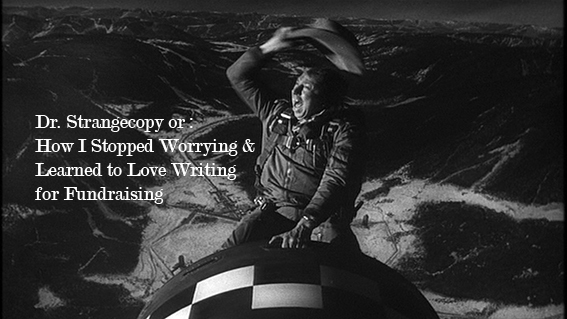 So it’s time you stood face to face with Dr. Strangecopy, and learned to stop worrying and love writing for fundraising. Every writer reads. A lot. Any writer who doesn’t probably isn’t a very good writer. Read everything Tom Ahern and Jeff Brooks and Mary Cahalane and Gail Perry have ever written. These 4 are my copy writing guardian angels. When I’m stuck, I turn to their stuff. And when you’re done that, read more. Read short stories. Read novels. Read poetry. Read bad poetry. Read advertisements in magazines. Read the description on your shampoo bottle. Read the headlines of the National Enquirer. Read the weird teasers on the front of old RL Stine Fear Street novels. Great writers read. Period. Make time for it. 2) Be curious with the shape of the stone. We’re all on a journey. Your organisation is on a journey to make its vision a reality. Your donor is on a journey of engagement with your organisation. And you are on a journey of connecting the two – today, all you’ve got is this very moment. In this moment, you need to write a damn good appeal letter. Imagine every piece of communication you send out to your donors is a stepping stone – towards engagement, towards a goal, towards your vision. Instead of worrying about every stone between where you stand and where you want to end up, what if you became deeply curious about the stone you found yourself on today? Why is this stone important? Why is it beautiful? Why is it problematic? In the grand scheme of stepping stones, what makes this one interesting? I know, that sounds like hippy dippy baloney. But when we can begin to be curious about our work on a deeper level, we can learn to have a more fulfilling relationship with it. Also, we do a better job. We all have different learning styles, but movement helps us all learn. Instead of staring at that horrifying blank white screen, get up and move around. If you are writing from an interview recording, get it on your phone and listen to it while you take a stroll. If you’re going from some larger document, take time to make a few (no more than three) jot notes of most important points and write them on your hand. Listen to music if it’s helpful. Mumble to yourself. Try expressing out loud any sentiments that come to mind. Of course, bring a tiny notebook or something to jot down any eureka moments, but otherwise, get yourself and the idea alone in the wilderness. 4) First thought, best thought. When you get an idea, follow it. Write hard and fast, and don’t worry about editing yourself. Too often, we want things to fall onto the page perfectly, but that’s not how writing works. Be willing to make mistakes. Be willing to ask yourself why something doesn’t work. The more space you allow for yourself to create that giant pile of crumpled drafts on your floor, the less space you’ll eventually need to make it work more quickly. Your first thought likely won’t be the best thought. But it will lead you to a better thought. Always. This is maybe the opposite of pumping yourself up. Writing compelling, emotional copy can be an emotional experience. The copy itself, of course, needs to be emotional if it does its job. You should get emotional, too. I just wrote an appeal in the voice of a middle-aged biker dude who was in a terrible accident. I’m a 32 year old dork who gets jumpy if I hear something in my basement. I need to bridge the emotional gap somehow, and that how is often music. Close your eyes and imagine. How frightening it must have been to see that truck swerve out. The feeling of waking up on the pavement and having no feeling below your neck. The sensation of having one of your rough and tumble work buddies hold your completely numb hand as you lay in that hospital bed. The experience of surprising your daughter by walking her down the aisle at her wedding, only 6 short months later. No, not your co-workers or your boss. Others who are working to improve their fundraising copy writing skills. The image of a writer toiling alone in the dark for eternity is false. Yes, at the end of the day, it’s just you and your keyboard. But there is a whole community of people out there who are working to tell better stories and improve their writing skills, and being a part of that community will only make you better at your own craft. 7) There’s no magic bullet. This list might be disappointing for you. Because there’s no magic bullet or potion to miraculously make you a better writer. It takes work. But it requires you to be gentle with yourself and recognise your own weaknesses, strengths, and triggers. Sure, it’s not the same as creative writing. But you need to flex your ability to get creative. You’re making a connection between words on a page and beliefs in people’s hearts. There’s no magic bullet, but it is kind of magic, isn’t it? can't wait to see yours Sheena! Oh man. You've got me all verklempt. I just happened on this post Sheena. I love the concept of the journey, with every piece of communication you send out to your donors being a stepping stone – towards engagement. And taking the time to ask: "What makes this stone interesting or special?" Well done! I think it is so easy to get discouraged by our communications if we focus too often on the 3000 ft view. If we can be interested in every message and curious about that particular step, I think we can tell better stories and connect with our donors.